Good parents meticulously scroll their children’s devices and set appropriate time limits, parental passwords, and controls on them. But I’m not the Experienced BAD Mom because I’m good at this gig! 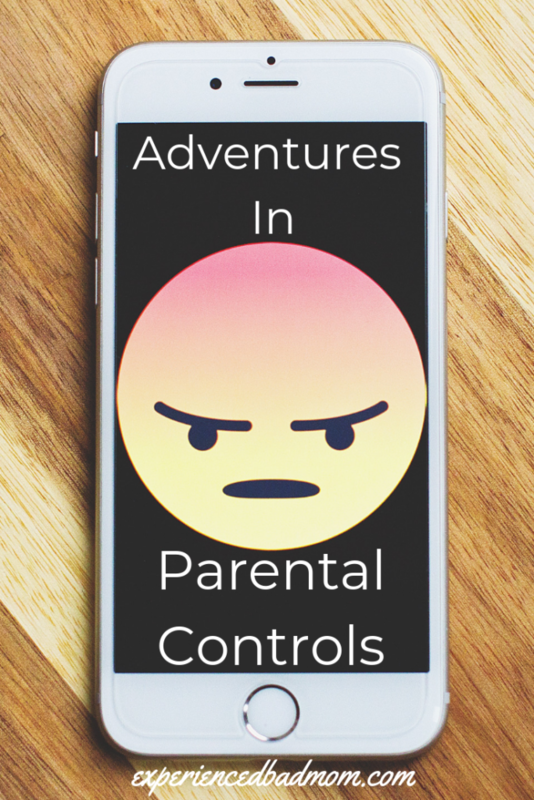 Now, my husband and I aren’t letting our teen and tween have free reign with their devices. I know their passwords and check their messages. We have a family charging station where the phones retire at night. My husband was bored at work one day when the power was out. He decided it was high time to become Super Dad. He figured out how to set usage limits for each app on our kids’ phones. After 15 minutes on Snapchat, for instance, the app is blocked. This brought immediate ire from our kids, even the twelve-year-old who isn’t on Snapchat or Instagram. “DAD!” was the refrain coming out of their mouths, over and over. Then the cacophony of asking him for more time started. Seriously, my daughter pointed out, how is 15 minutes of YouTube enough time to catch up on her favorite YouTuber’s new video about squishies? (She watches Moriah Elizabeth, whom I find very cute and tween friendly). Suddenly, though my fifteen-year-old son became quiet about the time limit. Turns out there was a glitch or error effecting Snapchat and Instagram. He had unlimited time on both apps, and was happy as a lark. My husband spent hours over several days trying to figure out how this could be. Did he set the limits for the old phone? Where was the error? What was going on? He was irritated. He was flustered. He was being driven mad. I was just glad all this technology gibberish wasn’t on me to solve. I can barely listen to music on Bluetooth in my car, people. Finally, my teen confessed to me, with a sly smile. He came clean to my husband. Now my husband hides his phone every time he enters his new password and approves a request for more time. He doesn’t trust the kids and he even hides the password from me, calling me their enabler, LOL. Fine. But if one of our smart kids guesses your password again, honey, then I won’t ENABLE them to tell you again! How’s the technology going in your house these days? Oh my gosh that is hilarious and so something my kids would do! It really makes me think they will be taking care of all my technology needs sooner rather than later! The Bark app–thanks for the idea, I will have to check it out!